DGATWFWA or “Driving Gringo and Tin E While Female While Asian.” Stereotypically, this would give others on the road some concern. In our case, this was Jenny throughout the majority of our drive through the Southwest. Lots of people have asked, “is driving our big rig hard?” It took some getting used to, but it’s not too bad now. Jenny has to push the seat up to the steering wheel in what is probably a position that no Ford engineer thought would ever be required in the F150, but once she’s settled in, she’s got trucker blood flowing through the veins. I’m proud of her driving except for when she drove us into a snow storm in Wyoming, almost overheated the engine in Nevada, and got us stuck in the mud in Santa Fe (which you’ll read about below). Other than those times, I’m the Thelma to her Louise. 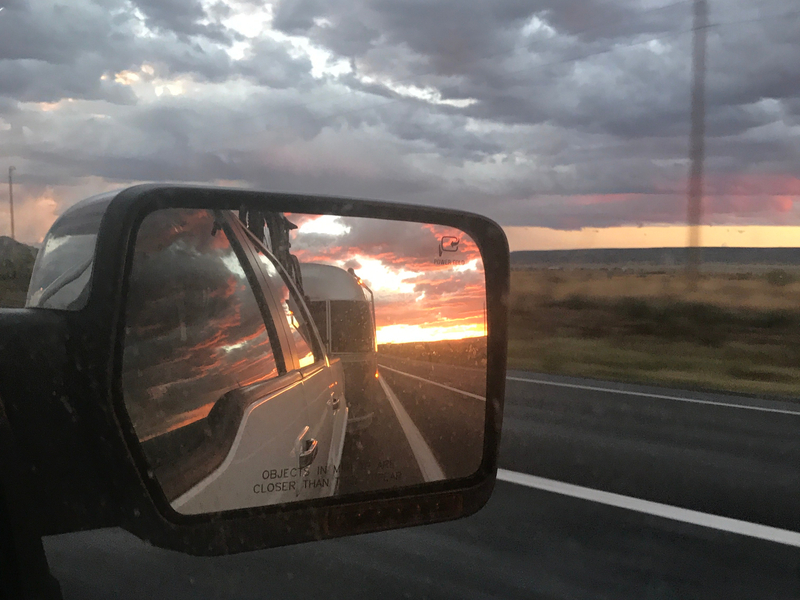 Just like Jenny’s driving (fast), here’s a quick rundown of our time in the Southwest. Visiting Zion National Park in Utah wasn’t on our original itinerary. Not that we really had an official itinerary, other than what was in our heads. After hearing so many friends and fellow travelers tell us about how wonderful Zion was, we decided to take a detour (slightly north) and check it out. Out west, there is tons of property operated by the Bureau of Land Management (BLM). Zion is no exception and we found another great campsite just down the street from the park entrance by way of our favorite website for such things, www.campendium.com. I’m including the link because I feel like we owe them something for all the free spots they pointed us too. Our campsite near Zion was beautiful, but it reminded me of either something out of Mad Max or that scene in Star Wars where the Sand People beat up Luke and Obi Won has to save him. Thankfully for us, the world hasn’t reached apocalypse status yet and we didn’t see any Sand People, just gorgeous views of the desert and mountains. The highlight during our stay in Zion was hitting the park’s famous hike called, the Narrows. The unique thing about the Narrows is you don’t hike on dirt, gravel, or rocks. Instead, you hike down the North Fork of the Virgin River. For those in the know, it’s considered the world’s best slot canyon hike. I don’t really know how many slot canyons there are, but this hike was a wild experience. For close to 2 hours, Jenny and I acted as underpaid Sherpas to our clientele E and Lil D. It was worth it though as we sloshed around in the river. Things got interesting however when Jenny’s client, dropped his paci into the river and it took off downstream. Feeling bad that my son’s paci was going to cause environmental harm to this unique ecosystem, I took after it. “Running” after a pacifier in 2-3 feet of water with your 4 year old attached to your back is not an experience that I recommend. For about 10 minutes, the pacifier is floating at 7 mph and I’m right behind at 5 mph with E saying, “go faster Daddy, get it, get it!” It was like slow motion quidditch in water with Harry giving that Dolby character a piggy back ride. We eventually grabbed it with the help of another parent who understood the severity of our predicament and Zion’s environment was saved. After Zion, we made our way to Flagstaff in Arizona. We spent a couple of days exploring the town and really enjoyed the “mountain town” feel. There were lots of good bars and restaurants, at least they looked good from the outside. The highlight of our stay in Flagstaff for E was throwing Jiffy Pop into our campfire. On the directions it explicitly says not to cook over a campfire. Well, we went crazy in Flagstaff and did just that. Jiffy Pop is amazing, but unless you like burnt popcorn, follow directions! The Grand Canyon was next on our Southwest adventure. You’ve seen the photos, so I don’t really need to say much about it. What you might not know is there are tons of Elk and Mule Deer hanging around the visitors center at the Grand Canyon. There are signs EVERYWHERE that tell you to keep at least 25 feet away from the animals. There might have been a language issue, because we nearly witnessed a Chinese tourist get completely gored by a massive Elk. She was standing about 5 feet from the Elk, posing for a photo, when the animal objected to her peace sign. Moving right along to Sedona, we had my good friend “Big E” stay with us for a couple of days so the guys could hit the local mountain biking trails. If you are a mountain biker, Sedona doesn’t disappoint. We crammed in 8 hours of riding in two days and barely scratched the surface of all the good single track Sedona has on tap. Here’s an insider secret to enjoying the trails – make sure you have an amazing wife who is willing to take the kids for 2 days while you go and have fun. Waking up to hot air balloons flying over our campsite was a treat as well. Leaving Sedona, we were off to Santa Fe via Albuquerque. We didn’t do anything in Albuquerque other than hear about how we should stay another week so we could witness the balloon festival. Look up photos of the Albuquerque balloon festival – it’s incredible. We probably should have stayed, but we were off to Santa Fe to make the Harvest Festival at El Rancho de las Golondrinas as it was only open for another day. The Harvest Festival was really cool, but what we will always remember is getting Gringo (the truck) and Tin E (the Airstream) stuck in the mud. And when I say “we”, I mean Jenny. Apparently, it’s a thing in New Mexico where after a rain, lots of cars get stuck because they have dirt parking lots. No one told the tourists with the Maryland license plates and we got our rig dug in good as we arrived for the festival. After seeing me struggle in the mud for a bit, a nice Santa Fean told us our best bet was to let the sun dry out the mud for a couple of hours. I pretended not to think about the situation in the parking lot while enjoying burritos, arts and crafts for the kids, and learning about Mexican Heritage. Thankfully, the sun worked its magic and we drove off still happily married later that day.